Wisconsin IAM District 10 and Local 873 have struck another huge win for IAM members and working families throughout the state in the fight against GOP Gov. Scott Walker’s right to work (for less) law. A U.S. District Court judge has sided with the Machinists Union and ruled a portion of the law, which prohibited “dues checkoff authorizations” unless revocable upon 30 days’ notice by an employee, is in direct violation of federal law. The ruling is the second win for IAM District 10 as it continues its ongoing fight against Walker’s right to work (for less) bill, signed into law in 2015. A Wisconsin judge sided with the IAM in a case challenging the state’s private sector right-to-work law back in April 2016. Research shows that by many measures, the quality of life is worse in states with right to work laws: wages are lower, people are less likely to have health insurance, the quality of education is lower, poverty levels are higher and the rate of workplace fatalities increase. While the recent court decision does not impact Wisconsin’s entire right to work law, other parts of the law are currently being challenged by District 10 in separate litigation. 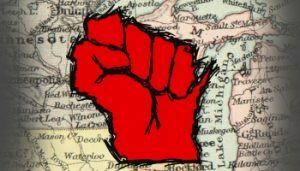 The post Wisconsin Right to Work Fight: IAM District 10 Wins Again appeared first on IAMAW.